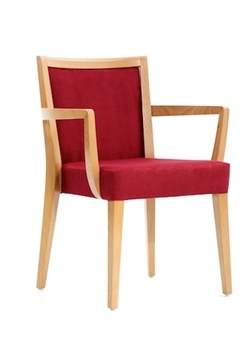 Arezzo Arm Chair - ukhealthcarechairs.co.uk. THIS CHAIR CANNOT BE DELIVERED TO DOMESTIC ADDRESSES. Arezzo Arm Chair, with wood frame, and seat upholstered in a range of anti-bacterial fabrics and vinyls. The chair is suitable for use in healthcare environments including reception areas or waiting rooms, or as a side chair in bedrooms or for use in dining areas. The wooden frame comes in a choice of 5 wood colour finishes. Further details on the upholstery composition and cleaning can be found by clicking the (i) on the tabs below.